It’s the ideal summer day—a blue sky stretches overhead, the sun hides behind puffy clouds, and the scent of freshly cut grass happily mingles with roses and honeysuckle. There’s no doubt that nature is asking you to come out and play! Don’t worry about loading up the car and driving somewhere—a playground of possibilities is right in your own backyard. Spread out a few quilts, pack a basket with portable fare, and gather the family for an afternoon of fun. Remember that casual can also be chic. 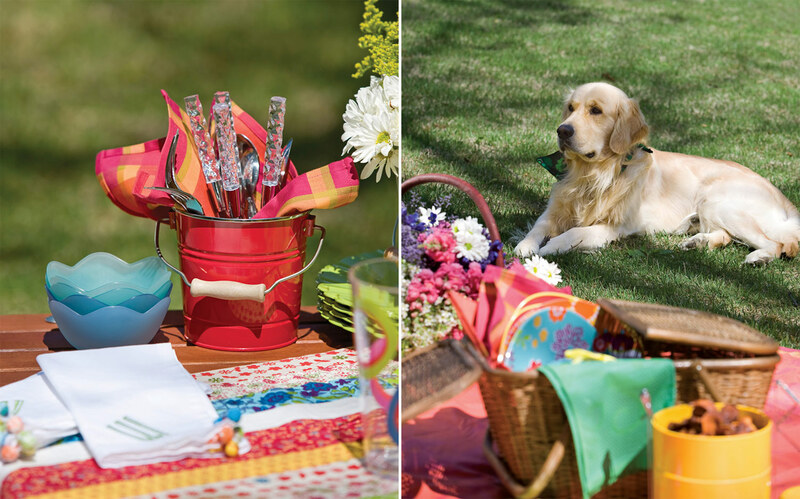 Add a dash of polish with vividly colored linens and melamine dinnerware in a variety of bright floral patterns. Use acrylic glassware bearing a whimsical design to coordinate with the color scheme, and slip fresh-cut flowers from your garden into a shiny, galvanized pail. The menu should be simple but delicious. Sweet Potato Chips with Onion Ranch Dip makes for a sweet-and-savory snack, while Smoky Barbecue Club Sandwiches are a picnic lunch staple. For fresh takes on outdoor dining classics, spice up classic fruit salad with Citrus Ginger Dressing and make our Minty Lemon Iced Tea. For dessert, our easy and delightfully portable Picnic Banana Pudding is a happy treat. When layered into Mason jars, this yummy dessert becomes truly special, just like this memorable afternoon spent only steps from your door. Easy-to-transport dishes are a picnic must. Accessories should be colorful and happy—and unbreakable. Use acrylic tumblers and Melamine dinnerware to both minimize accidents and serve as earth-friendly alternatives to single-use paper products. Fill Mason jars with layers of yummy banana pudding, then top with pretty fabrics tied with ribbons. 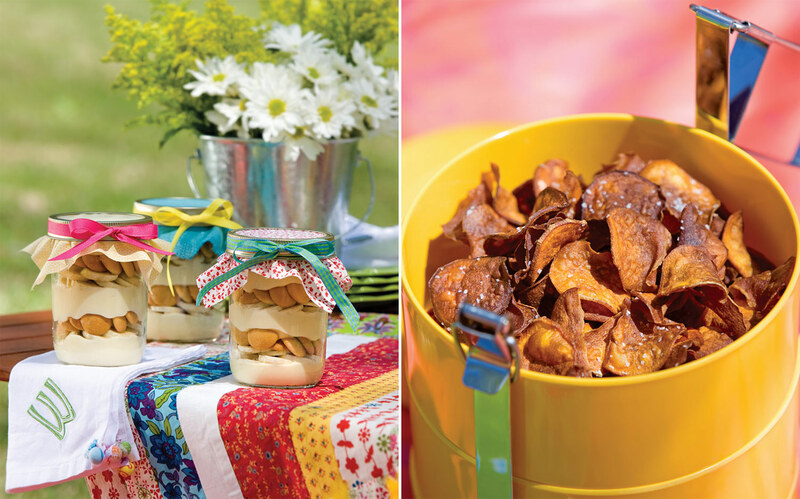 Keep sweet potato chips crisp and fresh in a multi-tiered canister that coordinates with the bright summery shades that spread from quilt to tableware to linens. 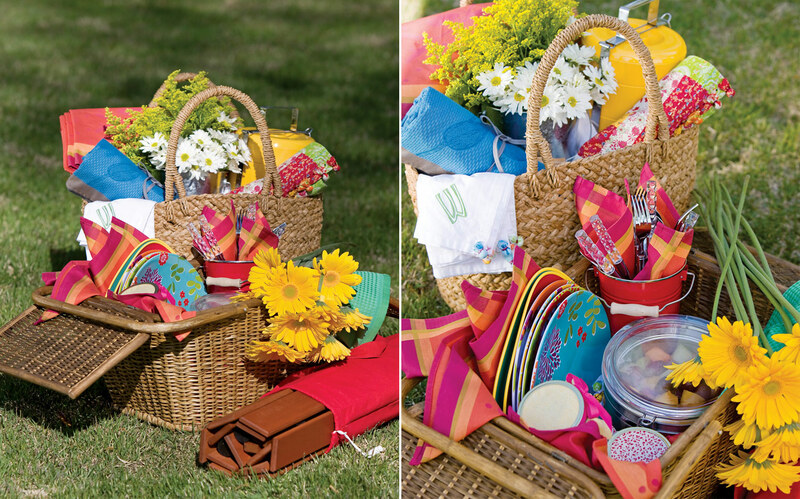 The ideal picnic should be easy to assemble and easy to pack up. A woven basket with ample room to carry all the accessories is essential, as are containers to keep food fresh. 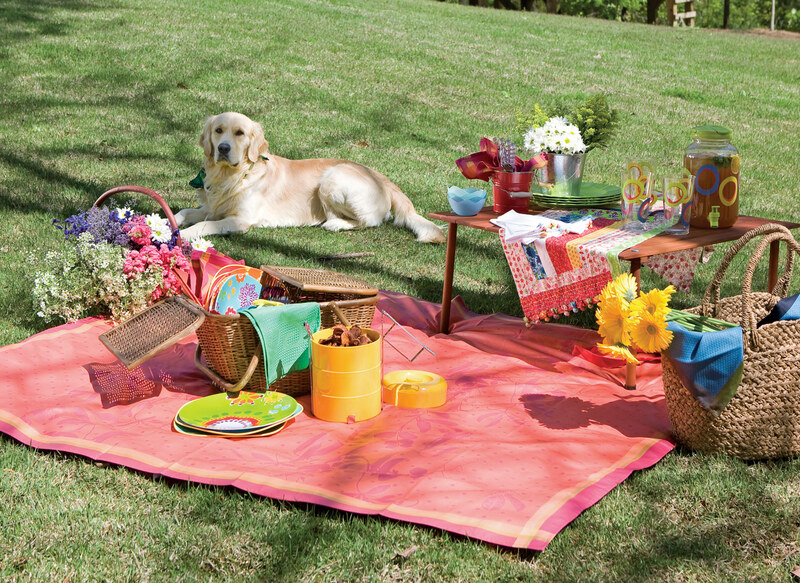 Beach towels in summery colors and patterns double as tablecloths—just toss into the wash at day’s end. To keep your goodies safe from uninvited “guests,” take along a roll-up table that tucks into its own bag for easy transport.